Morgan County has a rich blend of small agricultural towns and cities which offer various tourist attractions and visitor destinations like museums, educational institutions, parks, recreational activities, event centers, and more. To increase tourism and economic activity, Morgan County wanted a tourist focused wayfinding system to guide visitors from major highways to key tourist destinations throughout the county. 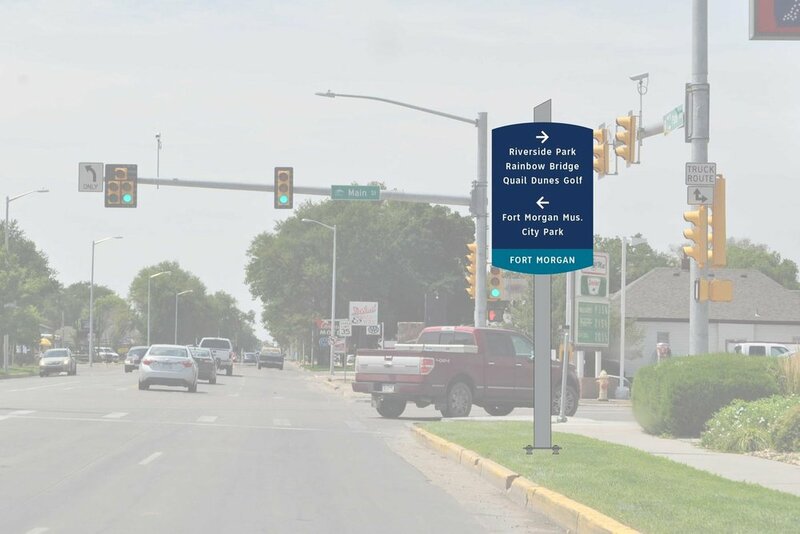 The signage system consistently provides graphic and structural elements that brand the county in the environment, projects a connection to the community, and meets the Colorado Department of Transportation regulations. Creating a more welcoming and active visitor environment, the wayfinding system is designed to create a sense of place. Actively working with the county and representatives from each town and city, Tangram developed a wayfinding signage system that weaves its way through both county and city streets. Signs located on county roads use a blue panel and yellow band to represent the county. When a visitor enters a city the color band changes to represent the brand color of the city or town one has entered. All signage materials are designed to meet the design guidelines from the Manual on Uniform Traffic Control Devices (MUTCD). The project is still ongoing.